Fact-checking whether slaves did build the White House. First lady Michelle Obama delivered a powerful speech at the Democratic National Convention in Philadelphia on Monday night, using her family's experiences in the White House to underscore how much progress has been made and to take aim at Republican presidential nominee Donald Trump's campaign promise to "make America great again." "I wake up every morning in a house that was built by slaves," she said. "And I watch my daughters, two beautiful, intelligent black young women, playing with their dogs on the White House lawn. And because of Hillary Clinton, my daughters and all our sons and daughters now take for granted that a woman can be president of the United States. So don't let anyone ever tell you that this country isn't great, that somehow we need to make it great again, because this right now is the greatest country on earth." Michelle Obama's description of her daughters playing on the lawn of a White House built by slaves struck a chord with some listeners — a poignant reminder of the historical significance of Barack Obama's serving as the country's first black president. While the White House is often referred to as the people's house, when construction began on the presidential residence in 1792, it was indeed slave labor that helped build it. This fact has popped up as a subject of interest over the years, and the White House Historical Association has a web page on the topic, with the headline "Did Slaves Build the White House?" "The decision to place the capital on land ceded by two slave states — Virginia and Maryland — ultimately influenced the acquisition of laborers to construct its public buildings," according to the website. (Courtesy White House Historical Association) A slave coffle passing the Capitol grounds, 1815, published in A Popular History of the United States, 1876. D.C. commissioners, according to the association, "charged by Congress with building the new city under the direction of the president," initially planned to import workers from Europe to meet their labor needs. 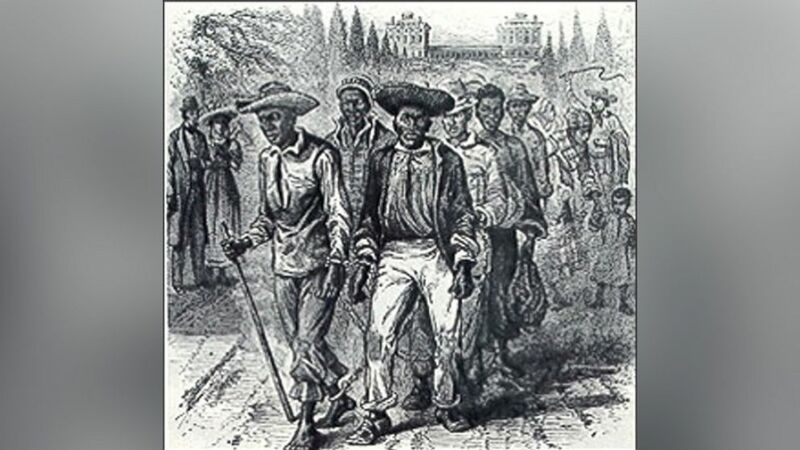 They then turned to African-Americans — "enslaved and free — to provide the bulk of labor that built the White House, the United States Capitol and other early government buildings." For the raw materials needed to construct the building, a stonemason, Collen Williamson, "trained enslaved people on the spot at the government's quarry" in Virginia, according to the association. Immigrants were also part of the crews that built the White House. "The slaves joined a workforce that included local white laborers and artisans from Maryland and Virginia, as well as immigrants from Ireland, Scotland and other European nations," the association website states. 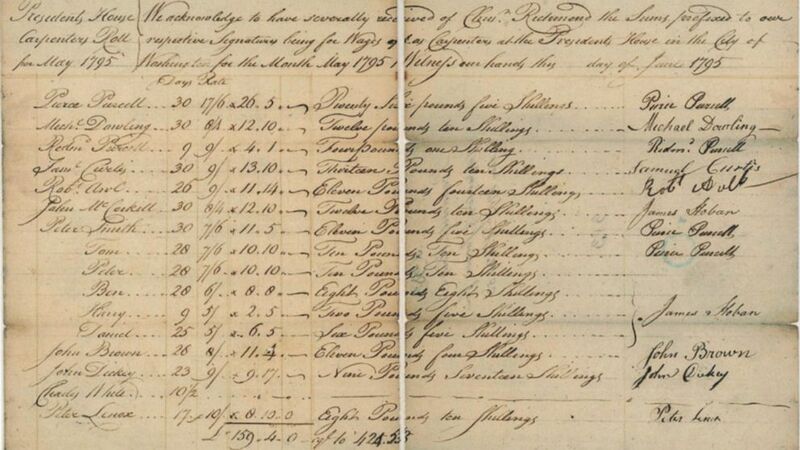 (Courtesy White House Historical Association) The payroll to slaveowners shows that the government did not own slaves, but that it did hire them from their masters. Slave carpenters Ben, Daniel, and Peter were noted as owned by James Hoban. The White House has undergone numerous renovations over the years — it was heavily damaged during the War of 1812, was expanded in 1902 and underwent a reconstruction in the early 1950s — many of which took place after the Civil War and the end of slavery in the United States. But as Michelle Obama pointed out in her speech, slaves first helped build the residence where the first African-American first family has lived for the past 7 1/2 years.